FROM every point of view the type 32 commercial monoplane recently produced by Societa Italiana Ernesto Breda, of Milan, is ДальшеMore>>> a very interesting aircraft. Aerodynamically it is characterised by exceptionally clean design, and structurally it incorporates features which make for lightness. From the operator's point of view it should have much to recommend it, as it carries a reasonably good pay load at a fairly high cruising speed over a range sufficient for most purposes. More specifically, the Breda 32 is a low-wing cantilever three-engined monoplane of all-metal construction, the expression all-metal being in this case literally true, as the covering is of metal. The gross weight is 14,300 lb., the engine power 960 b.h.p., and the wing area 915 sq. ft. As the maximum speed claimed is 147 m.p.h., the Everling "High-speed Figure" reaches the high value of 20.6, which must be regarded as very good indeed for a three-engined aeroplane, and indicates that the minimum drag coefficient of the whole machine is very low, so that the impression given from the front view on the next page is in this case in accordance with actual aerodynamic facts. Unfortunately this is not always so. If one assumes a propeller efficiency of 0.75 the minimum drag coefficient, or at any rate the drag coefficient corresponding to maximum speed, which is near enough the same thing, becomes 0.018 in British "absolute" units. Of the structural details of the Breda 32 more will be said later. At present it will suffice if we point out that the gross weight of the machine is 14,300 lb. and the tare weight 8,360 lb., so that the ratio of gross to tare weight is 1.71, which must be considered good for a cantilever monoplane. In other words, the machine carries as disposable load 71 per cent, of its own weight. Operationally the Breda 32 may be described by saying that it carries a total disposable load of 6.2 lb./h.p. at a cruising speed of 131 m.p.h. The allocation of this load may, of course, be in any proportion desired by the operator. Normally the machine has tankage for 2,310 lb. of petrol, giving a range at cruising speed of 840 miles. With its normal crew this tankage leaves a pay load of 2,981 lb., which corresponds to a pay load of 3.125 lb./h.p. For a cruising range of 840 miles this is quite a good figure, and indicates that the machine should be fairly economical to operate, especially taking into account that its performance is above the average for Europe. Basing the design on a cruising range of 840 miles, the cabin has accommodation for 11 passengers. If one assumes an average weight per passenger of 180 lb. there is still left 1,000 lb. of pay load, either in the form of luggage (nearly 100 lb. per passenger) or freight or mails. This fact puts a slightly different complexion on the apparently high horse-power (87) per paying passenger. In external appearance the Breda 32 resembles the Junkers machines. In fact, it is difficult, not to say impossible, to build a low-wing cantilever monoplane which does not resemble a Junkers. In detail construction, however, there is little or no similarity. The cantilever wing, of all-metal construction, is set on the fuselage at a pronounced dihedral angle to give lateral stability, and lateral control is ensured by ailerons of large span (approximately one-half of the wing span). The ailerons have their hinge line so arranged as to give a certain amount of aerodynamic balance, thus reducing the force which the pilot has to apply to the control wheel. The tail surfaces are of orthodox aerodynamic design, with horn balances for rudder and elevators. Considerable care has been taken in producing the lines of the fuselage. The slope of the decking in front of the cockpit, and the angle of the windscreens, is such as to give as smooth a flow as possible while yet retaining a good view for the pilots. That the view is good in spite of the cowled central engine in the nose of the fuselage is indicated by the photograph on the next page. In the placing of the wing engines much thought has also obviously been expended. The wing engines are placed on a level with, but well ahead of the leading edge of the wing, and the engine mountings have been very carefully faired into the wing so as to cause as little disturbance to the air flow as possible. The low-drag engine cowlings may be assumed to smooth the flow over the engine nacelles so that here again everything possible has been done to reduce drag, while the fact that the airscrews are well away from the leading edge should make for smooth working and a minimum of interference. The outboard engines are arranged with their axes at a slight angle (in plan view) so as to direct the slipstream on to the fin and rudder. This arrangement also is of some assistance when one of the wing engines is out of action in that it slightly reduces the turning moment and makes the rudder more effective. The undercarriage consists of two large wheels, each placed under its wing engine, and the wheels are partly enclosed in "spats" to reduce air drag to a minimum. The telescopic struts of the undercarriage are housed inside the leading edge of the wing, and only the forks carrying the wheels are exposed. A single diagonal strut braces each wheel against lateral loads. Brakes are fitted, and a castoring tail wheel which gives excellent manoeuvrability on the ground. The fuel is carried in tanks in the wing, one tank on each side, outboard of the wing engines, so that all fuel is well removed from the cabin and the fire risk should be very small. As a further precaution against fire, the petrol tanks are so arranged that the fuel can be quickly jettisoned, each tank having a jettison valve which is under the control of the pilot. In addition to the two main tanks there are two gravity petrol tanks, and in the event of failure of the petrol supply a hand pump is provided by means of which the pilot can keep the gravity tanks supplied. The cabin of the Breda 32 measures 14 ft. in length, 7 ft. in height, and the average width is 6 ft., giving a volume of about 590 cu. ft., which corresponds to about 53 1/2 cu. ft. per passenger. The seats are arranged in a somewhat unusual manner. Along each side of the cabin are three seats in line fore and aft. Against the back wall of the cabin is a sofa seat for two, making eight in all. If the machine is filled to capacity, however, it is necessary to take into use the three tip-up seats placed between the side seats. The occupants of the tip-up, seats take their places last, of course, and when they are in situ they and all the rest of the passengers except the two in the sofa are there for good. No walking about is possible. The arrangement is not one that would appeal to the majority of passengers on the London-Paris route. Air sickness is not an unknown ailment, and restricting the movement of the passengers in this way seems to be quite out of keeping with the otherwise excellent planning of the Breda 32. It may, of course, be that the machine is intended for routes on which a full complement of passengers will rarely be carried, in which case the objection does not arise, but the practice of rendering immobile passengers in an aeroplane designed to have a cruising range of 840 miles (or some 6 1/2 hr.) is not one to be commended. In other respects the cabin of the Breda 32 appears to be in keeping with modern ideas. The windows are made to open, and in winter the cabin is heated by air from a muff around the exhaust pipe of the central engine. 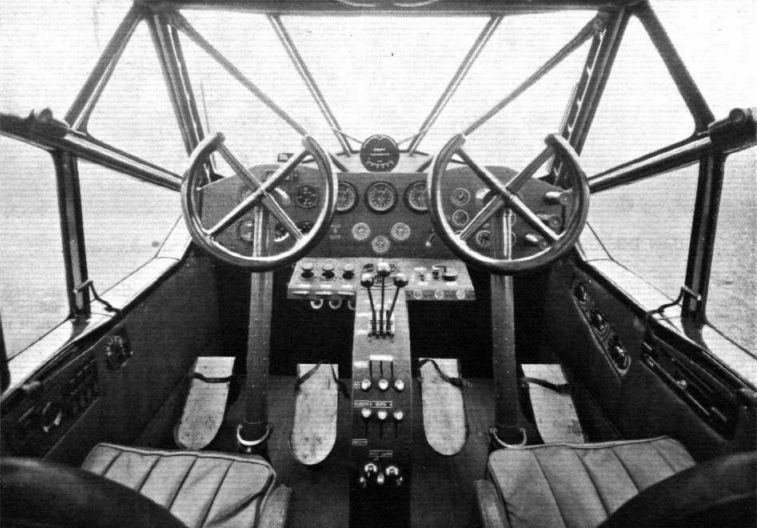 The pilots' cockpit is uncommonly well appointed, with two upholstered armchairs side by side, and the controls, instruments, etc., carefully arranged to be within reach and sight of both pilots. Behind the pilots' seats are two smaller armchair seats intended for the engineer and wireless operator. A crew of four for a machine carrying only 11 passengers may appear excessive, but presumably on some routes the crew can be kept down to two, and the other two seats used in an emergency for passengers. A NEW ITALIAN TRANSPORT PLANE: The Breda 32 three-engined all-metal monoplane. Equipped with 320 h.p. Pratt & Whitney "Wasp Junior" engines, it carries a useful load of 5,940 lb. at a cruising speed of 131 m.p.h. Further details of this machine will be published later. CAREFUL FAIRING: The wing engines of the Breda 32 are well cowled in, and the undercarriage has been streamlined by "spats" rigidly fixed to, and moving with, the wheel. On the right is a sketch showing how the metal skin is stiffened by "blisters." CLEAN DESIGN: Front view of the Breda 32 showing the absence of excrescences. THE BREDA 32 WING: A general view of the port wing, showing single spar, ribs, skin, etc. The four pipe unions by which the wing is attached to the wing root are seen at the right-hand extremity of the picture. 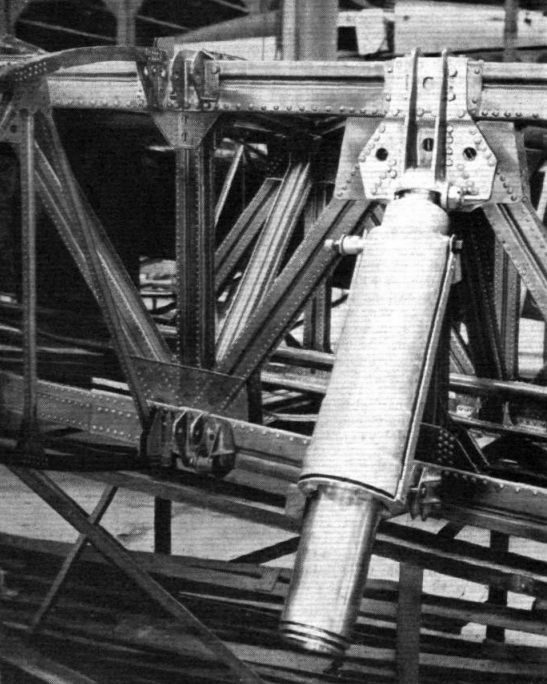 DETAILS OF WING AND UNDERCARRIAGE: This photograph gives a good idea of the construction of the single spar, which is a girder built up of box-section booms and struts. The telescopic leg of the undercarriage is attached to the spar, and housed inside the wing. The other lugs seen are for the support of the engine mounting. DUAL CONTROL: The pilots' cockpit not only affords an excellent view, in spite of the fuselage engine, but the arrangement of controls, instruments, etc., appears to have been given a good deal of thought. THE BREDA 32: View inside the cabin, looking aft. 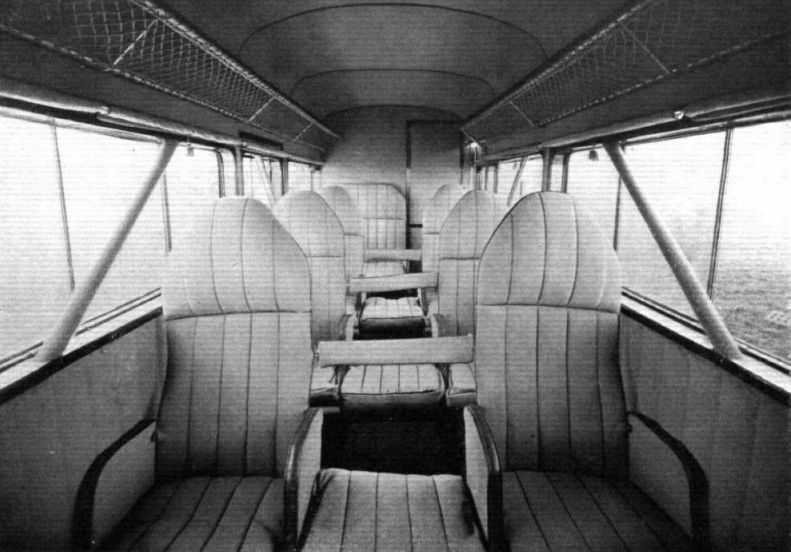 The central seats tip up to afford passageway for the other passengers. This feature is not likely to appeal to the majority of travellers.